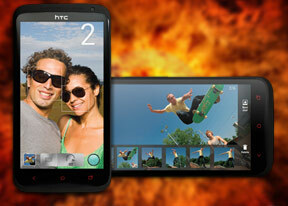 The main attraction on the HTC One X+ front is of course its 4.7" HD Super LCD2. It's not much different from that of its predecessor, but the second generation of Super LCDs is still one of the most impressive screens we have seen. The One X+ display remarkable image quality that few other LCDs can match. Not only is it really sharp (at about 312 ppi, it's virtually impossible to distinguish individual pixels), but also has great contrast and nicely saturated colors. Strangely enough, the One X+ screen turned out to slightly dimmer than that of its predecessor, but the good news is it offers superior contrast when used at full brightness. You can learn more about the testing process over here. The viewing angles are splendid - the icons have that look as if they are painted on the screen that we love so much. Sunlight legibility is good, although the lowered brightness and the improved performance of the competitors means that it's some way off the best we have seen. Overall, though, the HTC One X+ has a display to be proud of and one that will make every user happy. The low overall weight is another huge advantage of the polycarbonate body. At 135g, the One X+ is impressively lightweight for its size and that's one of the first things you'll notice when handling it. In conclusion, we have to say once again that we are still impressed with the HTC One X+ design and build materials. The smartphone feels really great in hand, due to its excellent ergonomics and use of space.